Art that inspires. Design with a purpose. Each unique piece is handcrafted in the USA with careful attention to detail and lots of love! Thank you for your interest in selling our product! We offer a variety of products for wholesale distribution. Click here to download our fillable price sheet and order form (PDF). It works best with Adobe Acrobat PDF Reader. Please email completed form to: sales [at] ahavadesign.com. 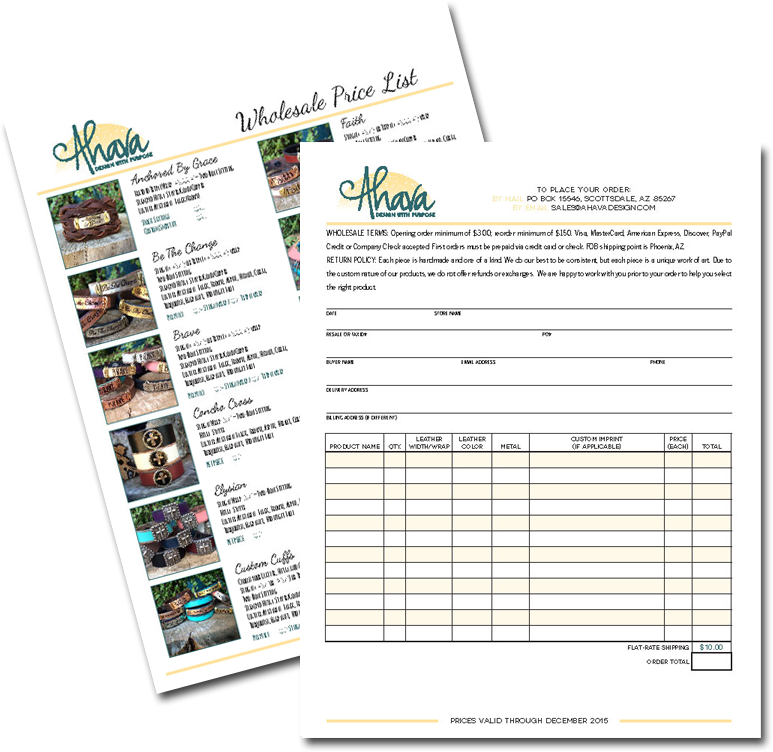 Click here to download our printable price sheet and order form (PDF). Please send by mail to: PO Box 55143, Phoenix, AZ 85078. Wholesale Terms: Opening order minimum of $300; reorder minimum of $150. Visa, MasterCard, American Express, Discover, PayPal Credit or Company Check accepted. First orders must be prepaid via credit card or check. FOB shipping point is Phoenix, AZ. Return Policy: Each piece is handmade and one of a kind. We do our best to be consistent, but each piece is a unique work of art. Due to the custom nature of our products, we do not offer refunds or exchanges. We are happy to work with you prior to your order to help you select the right product. All images are the exclusive property of Ahava Design and are protected under the United States and International Copyright laws. The images may not be reproduced, copied, transmitted or manipulated without the written permission of Jessica Hathcock.